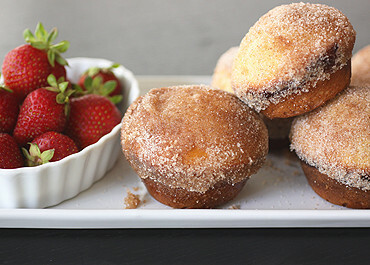 Similar to doughnut holes, but they are baked, not fried! Paired with some fresh fruit, they are a great addition to a weekend brunch. In a microwave-safe dish, heat milk to 110-115°F. Have all other ingredients at room temperature. Dissolve yeast in the warm water. In a mixing bowl, combine sugar, salt, shortening and spices. Add warm milk and stir to combine. Add 1½ cups of flour, yeast-mixture, and eggs. Beat 2 minutes with electric mixer on medium speed, or by hand until smooth. Stop mixer. Add the remaining flour and beat again with a wooden spoon until smooth, about 1 to 1½ minutes. Scrape down batter from sides of bowl. Cover. Let rise in warm place until doubled, about 30 minutes. Meanwhile, grease muffin cups. Beat down raised batter in about 25 strokes. Fill muffin cups half-full. Tap pans on table to settle the batter. Let rise until batter reaches tops of cups, about 20 to 30 minutes. Preheat oven to 400°F while batter is rising. Bake 10 to 15 minutes or until well browned on sides and tops. Tip puffs in pans until slightly cooled. Dip tops and sides of puffs quickly in melted butter, then roll in cinnamon-sugar mixture (combine sugar and cinnamon in bowl, stir to combine). Serve warm.